Product information "Clarinox Joeyduino™ Wi-Fi® + Bluetooth® Shield"
Introducing Joeyduino™, the first-ever Arduino®-compatible shield to support Wi-Fi® and Bluetooth® developments simultaneously. 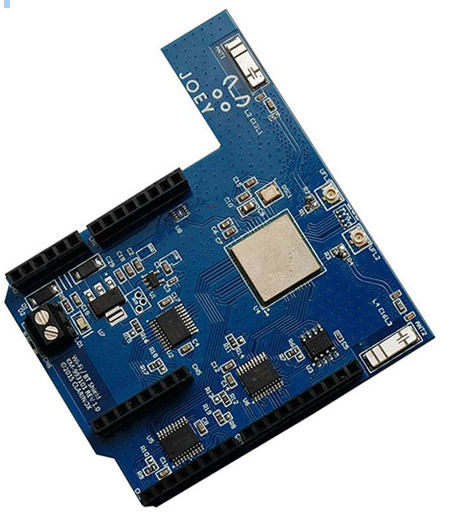 Joeyduino™ brings Wi-Fi, Bluetooth and Bluetooth Low Energy applications to the Koala® EVM and other Arduino compatible processor boards such as Intel Edison/Galileo, Infineon XMC4700 Relax Kits, STMicroelectronics® STM32F discovery kits. Connect the Joeyduino shield to the board of choice and start developing wireless applications with the Clarinox award-winning Wi-Fi, Bluetooth and Bluetooth Low Energy protocol stacks. • On-board Wi-Fi & Bluetooth single antenna coexistence. UFL connector available for optional SMA antenna. Related links to "Clarinox Joeyduino™ Wi-Fi® + Bluetooth® Shield"
Customer evaluation for "Clarinox Joeyduino™ Wi-Fi® + Bluetooth® Shield"